"Maitetsu" is a visual novel by Lose Studio released in 2016. The city of Hinamoto is a fictional city in Japan where railway travel is highly developed and trains are the only available transport. Each train is connected through a module with an Android girl, the so-called RailRoad. The protagonist of the story Soutetsu early lost his parents in a train accident and was adopted by the family Migita, who ran the brewery "Shochu" in the town of Okhitoyo. As soon as the guy grew up and matured, he decided to return to his hometown and help him solve the problem of water pollution and water Canadians because of the aviation plant. 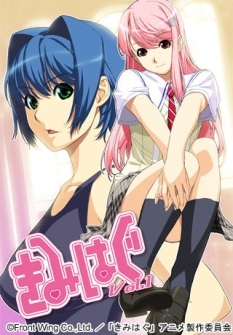 By a strange coincidence, Soutetsu awakens a girl-Android Railraod named Hachiroku and becomes its owner. He solves many of his problems with the help of a girl and decides to find her lost train with his half-sister Hibiki. Houshou Kisaki-a girl with a slim figure 83-58-85, height 160 cm, weight 47 kg and 3 breast size. 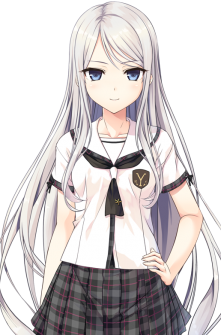 She is the daughter of the influential Mr. Hodge-San, as well as a close friend of the protagonist.